The milder, more humid than average season in the area this summer has suited these pests. Many people said it had been the worst season they’ve experienced. Some members also reported having suffered fruit fly infestation for the first time this year. (And yes, there were a few who escaped them without making an effort, but this number is very seriously dwindling!). We discussed various approaches to avoiding or dealing with fruit fly, as well as some of the ‘myths’ or misconceptions about them and the surprisingly long list of fruits that can be affected by fruit fly. And in case you need reassuring, we know how to protect home grown produce from them. Yet again we heard that members using exclusion nets had the most consistent success at growing fruit fly free. (NB: quite a few of us using nets did get caught out not having all our the nets in place early enough in the season this year. I wrote about my frustration at not protecting my apples sufficiently early and paying the price (see here). However, I’m pleased to confirm that where the nets were on in time (our ‘mini-orchard’) and for our wicking bed summer crops, it was all smiles as I harvested the protected fruits throughout the season. Our Seed Savers fruit fly information sheet provides more on the hows and whys of exclusion netting for fruit fly, as well as where to source the nets. Please check it out if you’ve taken a hit from fruit fly (or realise that there are fewer and fewer home gardeners locally that are getting away without taking action to avoid it). With this season still fresh in your mind, now is a great time to plan your efforts to ensure this is one pest you don’t lose fruit to next year. A less-than-one-minute video of Fruit fly, Albury NSW. This entry was posted in Event reports, Gardening challenges, Growing advice and tagged food growing, fruit fly, pests by Karen Retra. Bookmark the permalink. wondering if you have any home made fruit fly formaulations that work OK? I seem to have two sorts of flys – one slightly bigger with larger wings – maybe the fly in your pictures and one small narrow black fly (when wings folded) only 3mm long. 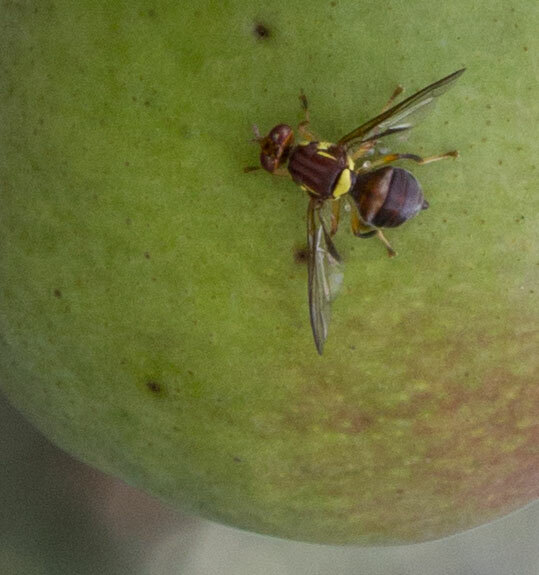 There were lots of these in my nectarines….. and in the other fig tree seems totally infested by them – as yet I haven’t noticed any maggots. Do you know what this may be? ?